Up until now we’ve enjoyed some cool crisp weather, but today it’s downright nippy! Which means a cozy layered look is a must. Instead of reaching for the usual pull-over sweater I like to opt for something less traditional like a poncho. I know sometimes it can seem overwhelming, especially for someone of my stature. 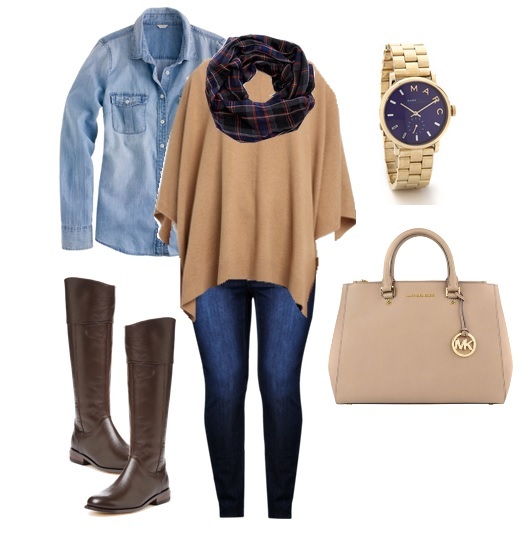 But layering it with a chambray shirt, scarf, and tall boots pulls it altogether for a chic fall look. Check out the outfit below and tell me how you would style this poncho? Yes, I'd totally rock this outfit! Perfect Fall look. Thanks for stopping by Daphne!